File Hosting service, is a hosting service specifically designed to host user files. It allows users to upload files, that could then be accessed over the internet from a different computer, tablet, smart phone or other networked device, by the same user or possibly by other users, after a password or other authentication is provided. FileFactory is one of the oldest and most trusted online file storage companies around. Providing reliable cloud file storage since 2005. File Factory offers easiest way to upload and share your files in the cloud. 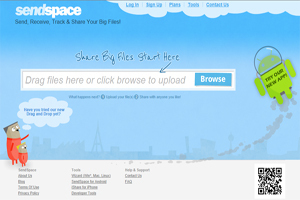 With Sendspace you can easy Send, Receive, Track & Share Your Big Files! 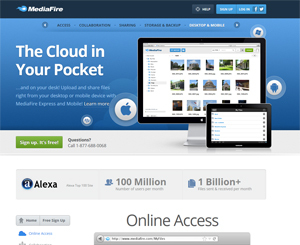 MediaFire is a free file and image hosting web site that started in 2005 and is located in Shenandoah, Texas, United States. They attract almost 60 million visitors annually. MediaFire offers 50 GB of storage and a limit of 200 MB per file, 250 GB of storage and 4GB of file size limit for Pro users and 1000 GB of storage and 10 GB of file size limit for Business users.